The blackbirding schooner Daphne was seized by HMS Rosario in 1869. Samuel Calvert (1828-1913) and Oswald Rose Campbell (1820-1887) – State Library of Victoria. 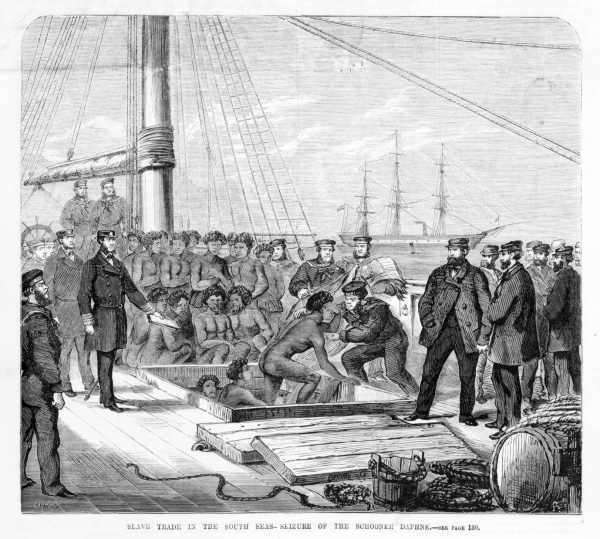 In 1847 Benjamin Boyd, an early colonial businessman better known for his whaling ventures, shipped 65 men from New Caledonia and Vanuatu to Eden on the south coast of New South Wales. 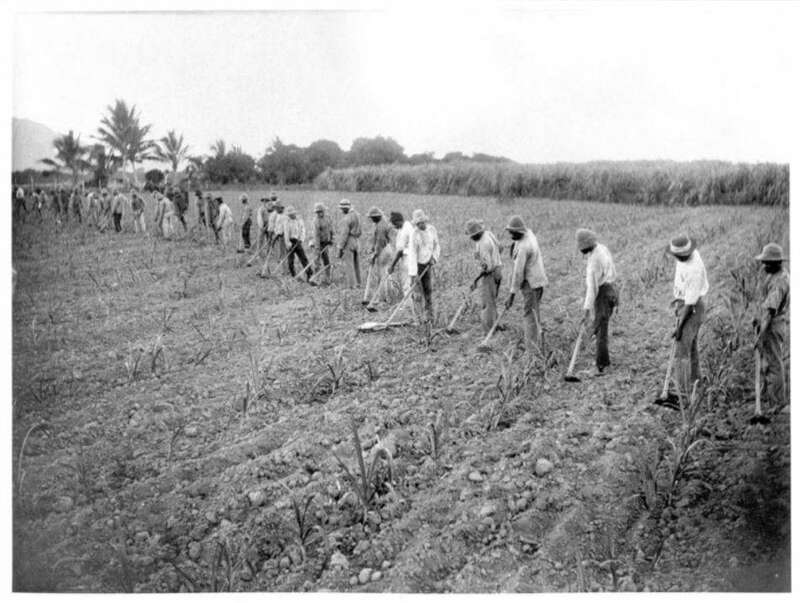 Boyd’s experiment in finding cheap indentured labour among the Pacific Islands was a failure, but he had foreshadowed a labour practice that was in many instances to hold all the hallmarks of slavery. In the 1860s, the demand for labor in Queensland, particularly in the burgeoning sugar cane industry, saw trading ships turn into labour ‘recruitment’ vessels across the Pacific. While some workers were indentured, brought to work in Queensland and returned to their homelands, many were not. Unscrupulous traders resorted to kidnapping and all sorts of tricks to entice people on board their vessels. Once on board, many had no idea of where they were headed and many died en route. From the early 1860s for the following 40 years, tens of thousands of Pacific Islanders worked on Queensland plantations. They came from 80 Pacific islands, including most of modern-day Vanuatu, Solomon Islands, Papua New Guinea, Fiji, Tuvalu and Kiribati. They were often underpaid and lived and worked in harsh conditions. This trade became known as ‘blackbirding’. Estimates vary as to the number of Islanders who were physically forced into the labour trade. However, as historian Clive Moore notes, ‘all of them were “culturally kidnapped’, meaning that traders took cultural advantage of the Islander’s small-scale societies and enticed them to come to Australia under circumstances they did not understand. 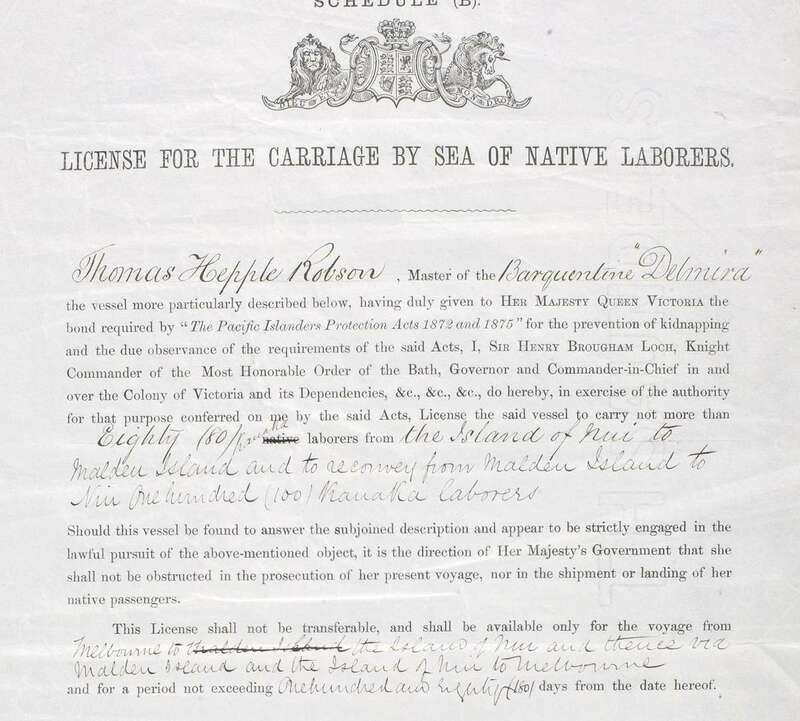 A license issued to Thomas Hepple Robson, Captain of Delmira, ‘to carry not more than 80 Kanaka laborers from the island of Nui to Malden island and to reconvey from Malden island to Nui one hundred Kanaka laborers’. This license was issued under The Pacific Islanders Protection Acts 1872 and 1875 ‘for the prevention of kidnapping and the due observance of the requirements of the said Acts.’ ANMM Collection 00051919. The colonial governments tried to regulate the trade, and the British navy was active in pursuing the worst of the blackbirders. With the Immigration Restriction Act of 1901, the law that underpinned the White Australia policy, such overseas indentured labour practices came to end. The Pacific Island Labourers Act of 1901 began the deportation process of around 10,000 Pacific Islanders from Queensland and northern New South Wales. Many had made lives in Australia and some Pacific Islanders mounted a political campaign to oppose the Act, sending petitions to the Prime Minister, and even the King, to no avail. The deportation of thousands of Islanders began in 1906 and continued until mid-1908. But around 2500 managed to avoid the act. From those who remained, a distinct Australian South Sea Island community emerged. The impact of Australia’s South Sea Island community (SSI), now with tens of thousand of descendants, runs deep. And their histories often appear in the strangest places. 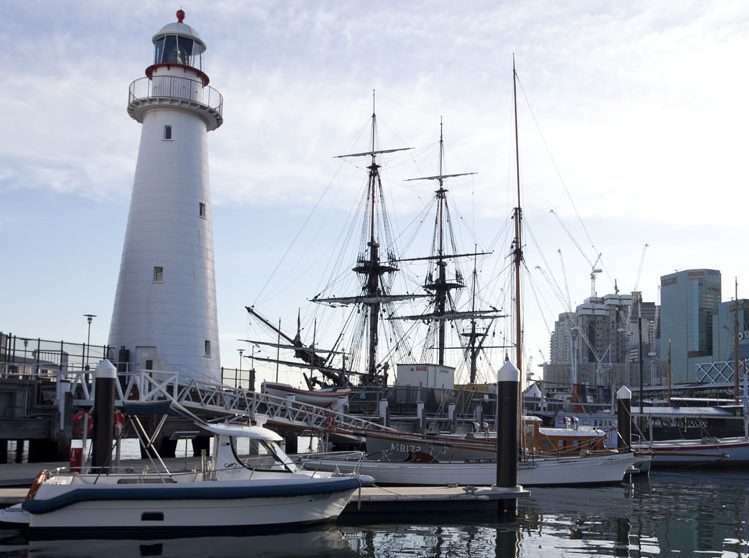 New research conducted on the Cape Bowling Green lighthouse, which sits in front of the Australian National Maritime Museum at Darling Harbour, has revealed construction work on the lighthouse in the late 19th century involved both Aboriginal and South Sea Island labourers. The Cape Bowling Green Lighthouse was built in 1874 and moved to the museum in the 1980s. August 25 is known as South Sea Islander Recognition Day. On 25 August 1994, the Commonwealth Government formally recognised Australian South Sea Islanders as a distinct community within Australia, and in 2000 the Queensland Government followed suit. Recognitions included the Islanders’ contribution to the economy and development of the state of Queensland. Questions have been raised by Australia’s SSI community about recognizing the role of early Queensland pioneers such as Robert Towns (Townsville) and John Mackay. These issues and the ongoing struggle for the community as well as calls for their history to be included in the broader narrative of Australian history will be discussed at a symposium organised to mark 110 years since the deportations under the White Australia policy. The symposium, organised by ASSI Port Jackson, will be held on 8 September and feature guest speakers including Bonita Mabo, AO, patron of the Sydney based ASSI community. Further details can be found here. – Dr. Stephen Gapps, Curator.